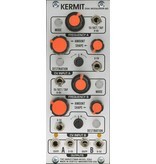 The Harvestman "Kermit" is a dual modulation generator with a cross-patched CV path and multiple frequency control modes. 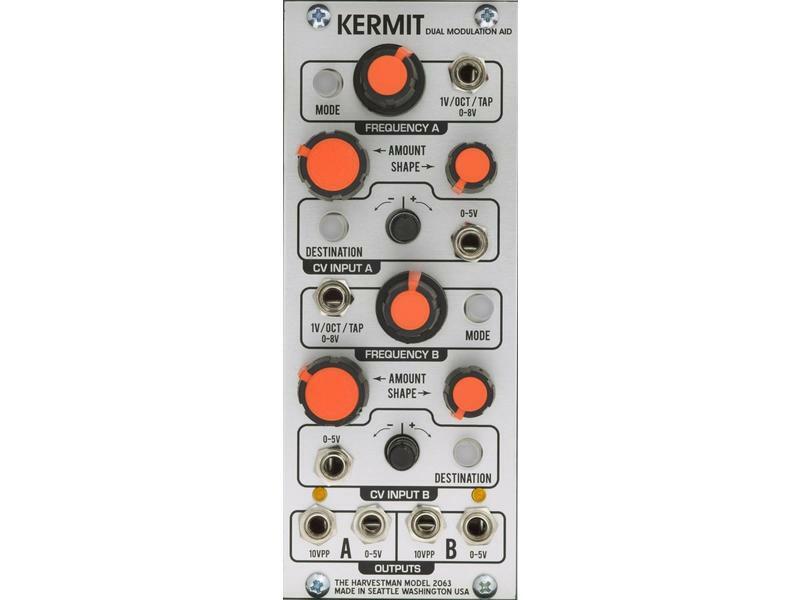 Kermit can work either as a wide-range LFO, or a 1v/octave tracking utility audio oscillator. There is a bonus "tap tempo" mode that imitates the frequency of incoming pulses, with its own unique character. Each section of Kermit has two outputs: a bipolar, 10vP-P output and a unipolar 0-5v output. Each behave correctly regarding the amplitude control: the bipolar output "grows outward" from 0v while the unipolar only ascends upwards from 0v. A LED on each side provides continuous visual indication of the output state. These two different styles of output are provided for the greatest flexibility in modulation, as well as proper interfacing to the CV inputs of the Harvestman Digital Audio Electronics system.